Canopy CARE streamlines the entire referral process, making it faster and easier to receive orders, obtain authorizations, and deliver results. “Access to an electronic referral management platform for the imaging space is a game changer,” said Worth Saunders, Canopy Partners CEO. Making the referral process clean and easy is long overdue. Canopy CARE automates the entire referral management continuum. The combination of services eliminates the manual steps required to perform prior authorizations, eligibility checks, payment estimations, and status updates. Advanced, cloud-based software facilitates secure data exchange and connectivity for referring physician orders and results. Patients get seen and scheduled faster, cancellations are reduced, and the overall experience for all parties involved is dramatically improved. Imaging providers can gain a unique competitive advantage in their local market, while freeing up valuable staff time for more important, mission critical priorities. Canopy CARE is a turnkey solution, backed by a 24x7x365 support team. Canopy CARE includes four components to simplify the physician referral process. 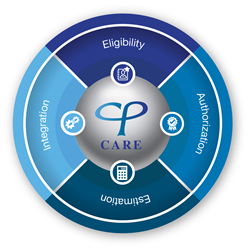 CARE Eligibility - increases data quality while reducing administrative expenses. The combination of electronic data with payer portal data returns the most comprehensive eligibility and benefit detail, resulting in a clear picture of a patient’s benefits. CARE Estimation - automates and accurately produces patient estimates before or at the time of service, increasing up-front cash collections and decreasing write-offs to bad debt. CARE Authorization - automatically queries payer websites for authorization information by payer/patient/procedure. CARE quickly returns authorization status, number, and expiration date in a fraction of the time manual checking takes. CARE Integration - enables secure data exchange and connectivity to and from referring facilities. Using Canopy Partners’ exclusive interface engine, orders are received and results sent in a variety of formats. This technology makes it easier for referring physicians and imaging providers to coordinate patient care. To learn more, please visit http://www.canopy-partners.com or email imaging@canopy-partners.com. Founded in 2011, Canopy Partners is a privately held healthcare technology company based in Greensboro, North Carolina. The company’s mission is to elevate the role of medical imaging in the healthcare value chain. Canopy Partners specializes in strategy and advisory services, revenue cycle management, enterprise imaging IT, and automated referral management for healthcare imaging providers. Since the company’s inception, Canopy has experienced rapid growth, nearly tripling its revenues and employees while expanding from coast to coast. The company has been named to the “Inc. 5000” list of America’s fastest-growing private companies in 2015 and 2016.